Jerry Kelly got a lucky break you have to see for yourself. Anyone who has seen "Happy Gilmore" remembers the iconic final scene when Happy makes a ridiculous putt to beat Shooter McGavin. Well, we might have just seen the real life equivalent of that insane shot. The provider of this moment: Jerry Kelly. 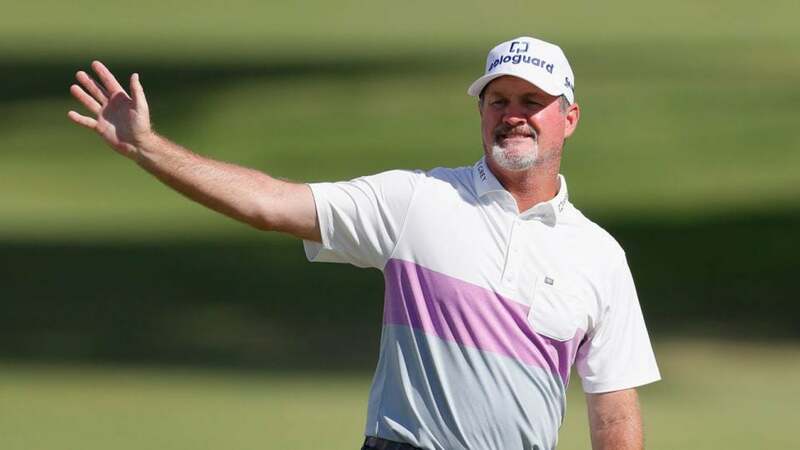 Standing at one under through his first six holes during the final round of the PGA Tour Champions' Mitsubishi Electric Championship on Saturday, Kelly was playing his second shot at the par-5 7th hole at Hualalai Golf Club in Hawaii. The defending champion was looking for an eagle in order to stay in contention at the Tour's season opener. Using a fairway wood, Kelly sliced his shot way right and immediately knew it wasn't going to end well. He turned away from the ball and dropped a few choice words in frustration. But what would follow was absolutely wild. Rather than landing in the lava rocks, the ball took two high bounces off the rocks, another bounce off the cart path, and then rolled onto the green. It rolled to set up an eagle putt for Kelly, who of course drained it. https://twitter.com/ChampionsTour/status/1086796795219464192 Kelly finished the tournament tied with Bernhard Langer for third at 14-under and three shots behind the winner, Tom Lehman.